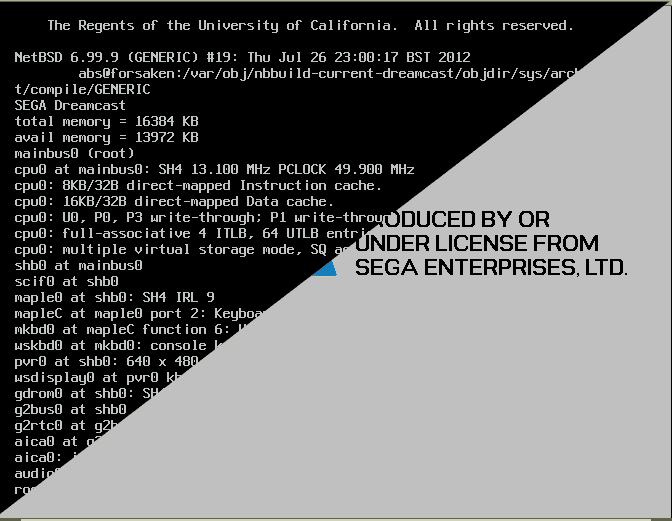 NetBSD0: Virtual Dreamcast - Virtual (a)Live? There has been something of a hiatus in my Retrochallenge 2012 postings. Last Tuesday evening I visited London Hackspace and... made it home in the decidedly early hours of Wednesday morning, rather neatly occupying the time during which I would have tried to do something Retrochallenge related and then have written about it. Then as ever, "stuff happened", but finally I have made time to get back to it! "...Last episode on Retrochallenge2012, I was doing something with a Dreamcast, or a VAX - I really can't remember now, possibly even combining the two in a gratuitous and potentially amusing fashion, but I did remember that trying to create a Dreamcast live CD was quite an annoying process, requiring as it did burning a CD-R each time to test. Enter gxemul, a very nice set of emulators which included one that could boot NetBSD/dreamcast, including a rather elderly NetBSD-3.0 live CD image. Unfortunately... I was unable to get a recent NetBSD CD image to mount - the kernel would load, I could view the start of the CD image partition which looked fine, but it would just refuse to mount the ISO9660 filesystem. Sprinkling some debugging prints in both the kernel and gxemul (it is *so* much nicer to be able to debug from both sides), revealed the NetBSD kernel trying to access sectors somewhere in the multigigabyte range (a neat trick on a medium with a maxiumum of 900MB capacity). The issue, it transpires, was gxemul only fakes up enough of a CD ToC (Table of Contents) to allow NetBSD to boot... specifically NetBSD 3.0. NetBSD 4.0 and later have stricter requirements. Actually the code is very similar and I have a horrible feeling that the fake ToC caused the NetBSD 3.0 gdrom code to fall off the start of an array and read some nulls. Nasty. So I went searching for the CD ToC specifications, and eventually determined that I needed the Yellow and Red Book standards, written by Sony & Philips and apparently still to this day considered commercially privileged and not freely available. However... their contents match the freely available (and catchy named) Standard ECMA-130: Data Interchange on Read-only 120 mm Optical Data Disks (CD-ROM) which has insane level of detail on the ToC (among other things). So I read the relevant section, rubbed my eyes a few times and read it again, then took out a pad & paper and thought about drawing diagrams... and then read it again. I considered the strange need for some engineers to produce overly complicated and involved solutions, and about technical writers who actively despised their potential readers. I just have to share Figure 15 at this point. Looks nice and simple? Just split up 96 bits into sections? Only... bits 0..97 makes *98* bits, and the Control bits have two extra bits (for free). Don't even get me started on how each track has 4 bytes in the ToC data returned, but something like 10 bytes in the spec. 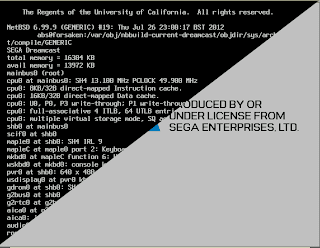 Final result is an updated gxemul which will boot NetBSD/dreamcast 3, 4, 5 & 6 kernels, a NetBSD/dreamcast kernel option to dump the gdrom ToC, and a tweak to the gdrom parsing code to reject too-fake ToC values.